Ian is an amazing Member of GWPFHA! 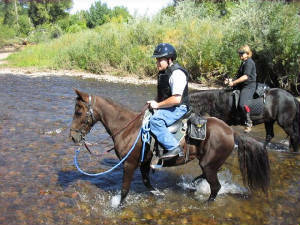 He is an awesome horse person and has been touched by the loving heart of the Paso Fino Horse. September, 19, 2007 at the annual Second Wind Fund teen suicide prevention walk I saw a man with a Newfoundland. I asked if I could pet him. The response was yes and we got to talking about horses. I remember my dad talking about a horse called a Paso Fino and after talking with the man for a while I learned his name was Kenny Curby. He said he had five Paso Finos and asked if I wanted to ride one of his horses named Hombre. I was so excited and immediately said yes. He told me there was a fun show at Douglas County Fairgrounds and said I was welcome to come and after the show I could ride. I went to fun show and watched from the Bleachers for little bit then the judging. I saw how smooth the movement was in the horses. I was amazed! I had never seen such a smooth moving horse. I was used to the movement of quarter horses. Well it was getting close to the end and Kenny asked if I was ready to ride. I said yes while trying to stay calm due to my excitement. Once I got on, Kenny asked if I wanted him to lead Hombre around. I immediately said yes because I didn’t think I could control him or have the balance to do it. We moved from a walk to a corto, then a largo. I couldn’t hide my excitement anymore. I had a huge smile on my face and my heart was pumping fast. After the ride I told my dad, “That’s the kind of horse I want.” After talking with my dad, making it very clear that I wanted a Paso Fino NOW, the decision was made to talk with my mom. My mom said she didn’t think I was ready for my own horse yet. You see, I have Spina Bifida which means open spine. I was born with it, am paralyzed from the waist down and am wheelchair bound. Well not really bound, I just use a chair when I am not skiing, riding a horse or a four wheeler. About a year later I was at the Evergreen Rodeo watching all the guys on horses and watching the team roping and steer wrestling and texting my mom saying how badly I wanted my own horse. My parents finally agreed (it took forever!) and my search for a horse began. 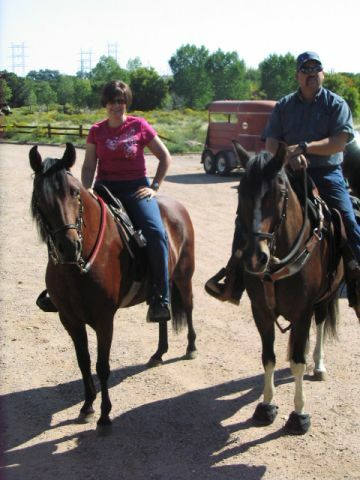 While I searched the internet, my dad called Kenny and said we were ready to get a horse. He told me to take a look on the Greater Western Paso Fino Horse Association website which needless to say I did continuously. A few days later Kenny told my dad and I that he had spoken with Pete and Donna Shelton of Mountain Meadows Paso Finos. They had a couple of mares for sale and we could take a look at them if we were interested. IF I was interested?? I had surgery four days before going to see the horses. But, it didn’t stop me and we went, cast and all. We met Donna and Pete. Donna immediately took me to see the horses she thought would be best for me. She introduced me to a horse they called Tesora who had a little foal with her. I looked over at another stall and got to see Bella Nina who was also for sale and had a foal with her. I rode both Bella and Tesora. First I rode Bella. Kenny said he would lead her for me. After a few minutes I said I was going to turn her left. He said “go for it.” I hadn’t even noticed he had unclipped the lead rope and I had been controlling her on my own. I began doing things like circles to figure 8s to backing her up step by step. I felt so comfortable on her. I also rode Tesora, but knew it was Bella I wanted. 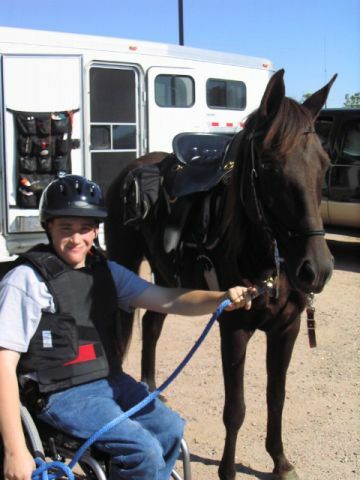 When I got off the horse, Donna asked me if I wanted to lead her around to see how she would do with my wheelchair. Bella followed me everywhere in my chair with the lead rope dragging off my shoulder. Donna had graciously made lunch for us so we all sat down and ate. After lunch, I went into the barn for a minute. When I came back out I heard Donna say, “Congratulations” to me and came over to me and gave me a hug. I had the biggest smile on my face. I was now the owner of a horse, my first horse. Bella was my high school graduation present. I was excited but knew it wasn’t just going to be just all fun and games. It was going to be a long bonding process, but not just bonding but caring for her and her needs and keeping her fit and healthy. That was a year ago, and I still think Bella is the most best horse ever. 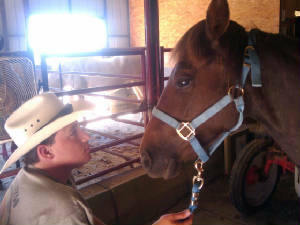 Kenny and Stacie board and care for her and I am able to see and ride her whenever I want.